According to market data the weight loss industry is about a $60 billion dollar industry in the United States. An estimated 108 million dieters are trying to lose weight. Calorie tracking applications have been a popular solution for dieters and applications like Apple’s Health and Google Fit make it easier to collect your health data. Calorie tracking, although a popular weight loss solution is tedious, time consuming and a pain to do. The Livestrong.com Android calorie tracking refresh was my hope to make the process of tracking calories easier for users. 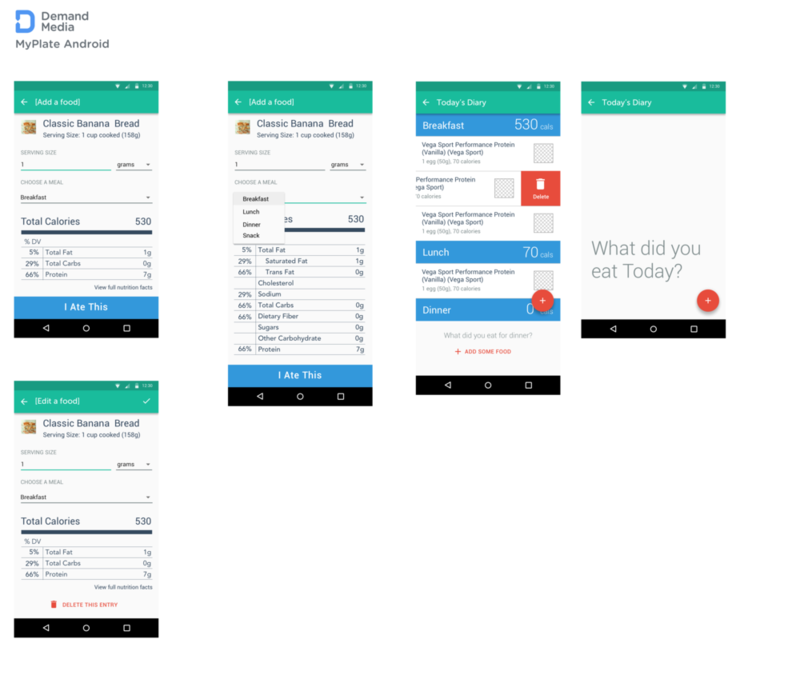 In the fall of 2014 a small team of us at Livestrong.com started reimagining the calorie tracking experience for Android. We started from scratch, taking cues from our existing mobile app for iPhone but really wanting to create an experience that is truly android. Using the language of Material Design to create a true Android Experience. To make the often tedious task of calorie tracking easier for everyone. Since we can be more nimble, experiment, iterate and learn from our past experiences. On this team I served as the sole UX designer working with two developers, two product managers and QA. We are a small but agile team that works very close with each other. I contributed to high-level strategic decisions with the rest of the product team and focused on being an advocate for the user. I provided a variety of deliverables throughout the project and saw features from initial conception, to iterating back and forth with the developers. MyPlate is a mobile app that helps you reach your diet, weight loss and fitness goals by tracking your daily calories and exercise. I was the design lead for the redesign of Livestrong.com’s Android application. I worked embedded inside the software development team and delivered sketches, feature workflows, wireframes, visual design specs and collaborated with developers to launch the application. At the start of a project I like to take the time to sketch out some UI’s on paper, I find its easier to try out several directions and organize all of the good and bad ideas swirling around into one place. I also sketched out flow diagrams for the tracking food logic. With the team we would do white boarding sessions where we would talk about the primary tasks the user would need to complete in the application and block out the architecture. Based on these sessions I would then use Sketch to create a wireframe of the application and work with the developers to build out the user interface. The primary focus of the application is tracking, food, water, weight and exercise. Using the FAB as the main tracking action we believed would help decrease tracking times and make the often tedious process easier for our users. Another hypothesis we are explored was exposing search on the home screen of the application. The primary action of the application is to search for the food you have eaten to then track. My hypothesis was that if we put search at the forefront of the application that people can find the foods they want to add quicker.